Beside many interesting tourism object to visit and uniquely traditional ceremony, Probolinggo also well known as a center of handicraft industry in various way and colors. 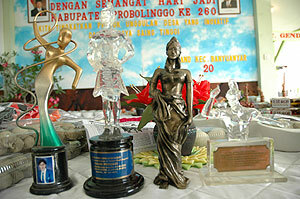 All those products are hand made by the Probolinggo’s craftsman. The products contain bamboo handicrafts, ceramics, garments, home decoration, bags, etc.